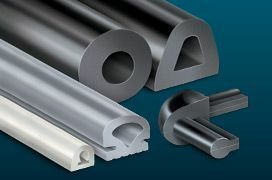 DryMax Stern Seal System is engineered for optimum sealing performance. 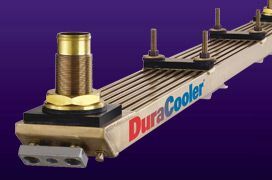 The DryMax Stern Tube Seal System was designed, built and tested by Duramax Marine in the USA. The seal is a water-lubricated axial shaft seal system constructed of the highest quality materials which have been engineered to deliver long service life. 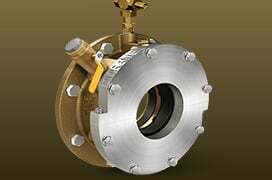 The DryMax Shaft Seal is a reliable system that uses no grease or oil and is easy to install and maintain. It is a great addition to a full line of proven and reliable marine products developed by Duramax Marine and engineered to protect the environment. Designed for heavy duty service in clean and dirty water. The DryMax Seal has been engineered and tested for service in both Blue (clean) and Brown (gritted) water operating conditions. Our research and development team conducted experiments on our full scale test rig built to simulate the most difficult service conditions. The Duramax DryMax Shaft Sealing System can be installed in new construction or replace an existing shaft seal. In retrofit applications Duramax engineers can design an adapter plate that mates with the vessels existing stern tube flange to simplify installation. The DryMax Rubber Sealing Ring is very durable and is easily replaced if necessary. 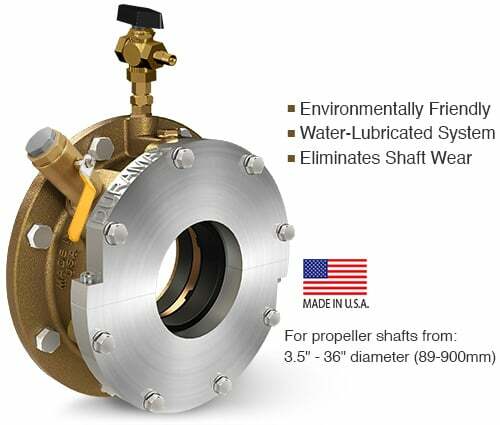 The ring is constructed of proprietary nitrile rubber that rotates with the propeller shaft and creates a hydrodynamic sealing interface with the highly polished DuraChrome Mating Ring. Every seal assembly includes an active rubber seal and a spare seal ready on the shaft for change out when needed. The DryMax Seal Ring is engineered to deliver a long operating life. Maximum seal life with DuraChrome Mating Ring. The DuraChrome Mating Ring can be reversed and reused with the spare rubber ring that is stored forward of the seal assembly on the shaft. Once both sides of the DuraChrome Mating Ring have been worn it can be restored by machining in a lathe. The Alloy used in the DuraChrome Mating Ring was engineered to optimize operation with our rubber seal ring. Heavy duty cast bronze housing and components. The housing and internal components of the DryMax Seal are made from a high grade cast bronze. The material was selected to resist corrosion and in many cases will last the lifetime of the vessel. Easy maintenance of DryMax Seal System. Self retracting inflatable air seal ring. 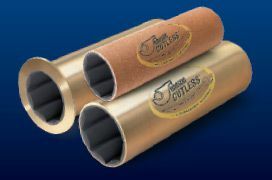 Duramax Marine was the first to introduce a patented air seal in the Johnson Heavy-Duty Stuffing Box. Our engineered Inflatable air seal is used as a safety feature on the DryMax Shaft Seal System. The air seal is held by a bronze retaining ring in the housing. It can be pressurized to make contact with the shaft, preventing any seawater from entering the vessel. It’s a safety measure if leakage exceeds allowable levels. It can be pressurized to replace the rubber seal ring at sea without dry docking. Engineered for easy seal ring change out. The DryMax primary sealing components can be renewed easily with the vessel at sea. With seawater restricted by the inflatable seal the split DuraChrome Mating Ring can be removed and the old seal ring replaced with the spare seal. 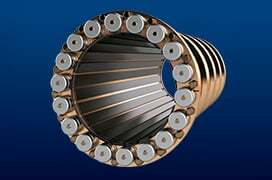 The split DuraChrome Mating Ring is reversible and switching to the unused side extends service intervals. Shaft Earthing Device for corrosion control. 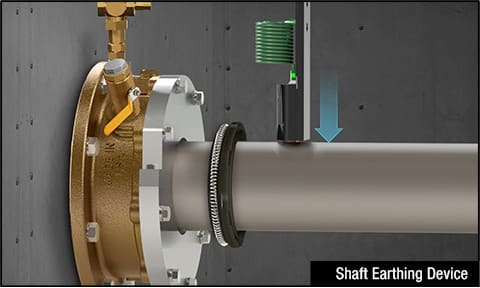 The Duramax DryMax Shaft Seal System includes an earthing assembly to help prevent shaft corrosion. The assembly contains a replaceable carbon brush that is spring loaded and grounded to the ship’s hull. DryMax® is a registered trademark of Duramax Marine® LLC. DuraChrome® is a registered trademark of Duramax Marine® LLC.